Institutions and technology don’t understand each other very well. That is both surprising and frustrating because they each change the shape, and influence the performance and potential, of the other in profound and sometimes unexpected ways. The interaction of institutions and technology has always been important, but perhaps never more so than now, as we stand on the edge of the networked digital era whose possibilities, potential and risks we’ve barely started to understand, much less master. In this book, we explore the different ways in which digital technologies are changing the shape of many of the core institutions of government, business, education, and civil society. We think that will help us understand better how that interaction is creating new institutional forms to improve the way we tackle the big risks and opportunities – growth, sustainability, jobs, poverty and inequality, new infrastructure, better services, and stronger governance based on rising trust and legitimacy to name just a few – that will determine how we live, and how well we live, into an uncertain and volatile future. 4.0 out of 5 starsThe default is always "open"
Thought provoking concepts challenging the status quo of organisational thinking and design. Well worth the read for those thinking about the way forward for their organisations-big or small. As expected, it is beautifully written with a great turn of phrase. The book moves well along the path of detailing how the interaction between technology and institutions will reshape these entities - openness, connectedness and responsiveness - seem to be the author's catch cry coupled to new innovative business models. The book successfully discusses technology disruption arguments and examples of current business and institutional models illustrate this well. The chapter on education institutions brings these issues together most succinctly. The final framework provides the reader with plenty to think about! 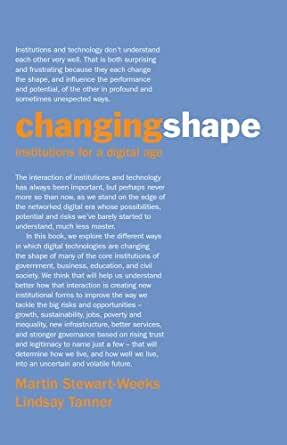 If you are curious about the potential impact of Internet based digital technology on institutional evolution, then this book is for you. Abounds with insights and useful perspectives for institutions navigating this "age of turbulent and unpredictable transition" and leaders interested in progressing the "networked mindset". Will resonate for anyone looking to sharpen their ear for the early signs of disruption... and quicken their ability to move with the times. Martin and Lindsay have written a thought provoking piece that does a great job in framing up the impact of the digital disruption that is occurring in all industries, what that means to the structure of the Enterprise and the social effect it continues to have in our communities. It's well research and beautifully written. Recommended reading for all.